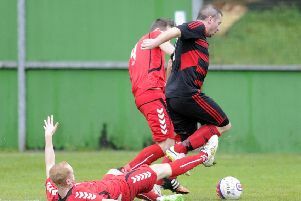 Reece Pearson seals victory with Rob Roy's second goal against Auchinleck Talbot. Rob Roy produced an outstanding display of quality football to take all three points against reigning Super League champions Auchinleck Talbot. Before the match Rabs manager Stewart Maxwell said he was confident his side could give Talbot - a team he described as arguably the best in junior football - a run for their money. And in the end the Kirkintilloch side, with some fortune, could have won this match at Guy’s Meadow by a even greater margin. Rabs were first to threaten when, from a Gavin Mackie corner, Scott Upton sent his effort over the bar before Chris Duff fired a powerful volley off target. In the 5th minute Talbot’s first chance fell to Dwayne Hyslop but his shot went narrowly past Jordan Brown’s right hand post. Rabs had a chance to take an early lead when Kevin Watt sent a header towards the net, only for Talbot’s keeper Andy Leishman to dive full length across his goal to parry the ball to safety. However the breakthrough Rob Roy needed came in the 15th minute when, from a perfect Willie Sawyers cutback inside the penalty box, Watt rifled the ball high into the net. The Ayrshire side fought back and home ’keeper Brown did well to smother Graham Wilson’s low angular drive, before Gordon Pope sent a drive over the bar from 25 yards. The alert Rabs ’keeper was again in action, this time brilliantly pushing a 20 yard Wilson free-kick wide of his post. As the interval approached it was Rabs who were creating the better openings with a good move between Sawyers and Mackie ending with the winger shooting wide. The first chance of the second half also fell to Rabs, in the 48th minute, when Sawyers rose to head a Mackie free-kick wide of the target. Ten minutes later Watt’s deflected rasping drive from fully 20 yards clattered against the Talbot crossbar. At the other end Keir Milliken had a couple of chances for Talbot but his finishing was poor. Talbot’s raids on the Rabs goal were mainly by the aerial route which were either swallowed up by the home side’s towering central defenders or by the excellent handling from young ’keeper Brown. The Kirkintilloch side continued to play precise football and were rewarded with three minutes remaining when they sealed victory with a second goal. Substitute Ally Martin broke down the left wing before sending a low cross into the penalty box where Sawyers made a clever dummy and the ball fell to Reece Pearson in front of goal to side foot the ball into the corner of the net to make certain that the maximum points would be staying at Guy’s Meadow. Rob Roy: Brown, Finnigan, McKenzie, Barr, Boyle, Whelan, Duff (Pearson 77), Upton, Sawyers, Watt (Aitken 66), Mackie (Martin 64). Subs not used: Unused Subs;- McMenamin, Murdoch.